Veggetti Review and a Recipe! 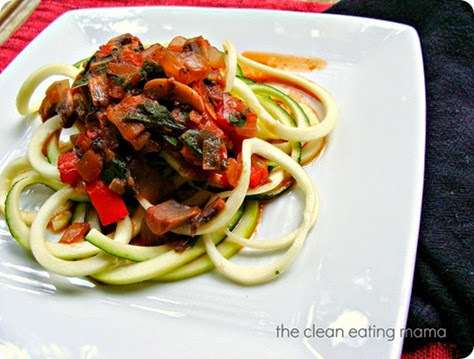 If you are looking for a new way to incorporate more veggies into your diet, try raw zucchini noodles! 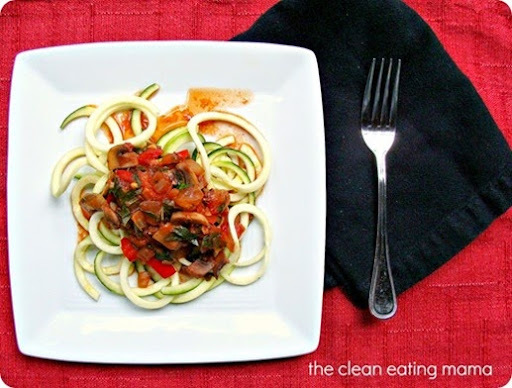 I have been eating and incorporating raw zucchini noodles into my dishes for a long time – pasta dishes, salads and cutting them up and eating them with hummus! 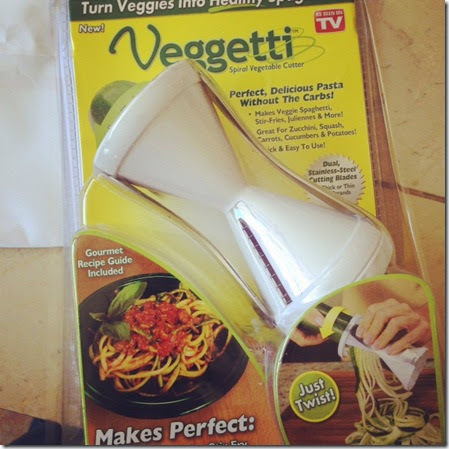 I have a veggie spiralizer that I normally use for my noodles but a PR rep for Veggetti contacted me and asked if I wanted to try it out – I was pretty excited for this opportunity! It has two sides for either wide noodles or thin noodles. And it’s super easy to clean up! The only issue I had was the lid – you are supposed to place your veggie in the spikes on the lid but it never did work for me so I tossed it. Using my own hand worked much better! I created two dishes – one salad and one pasta dish. My salad was amazing! I used my spiraled zucchini and combined red cabbage, red bell pepper, green onion, garbanzo beans and cilantro. I then created this hearty ragu which contains mushrooms, fresh herbs, red bell peppers and red wine. This meal is half raw and 100% vegan. I hope you try it for dinner soon! Heat a large sauce pan with oil over medium heat. Add onion, garlic, pepper and a pinch of salt. Let it cook down for 5 minutes, or until onion is somewhat transparent and soft. Add mushrooms, olives and herbs. (I used 4-5 sprigs of Italian parsley and 10 fresh basil leaves, all chopped up). Let cook down for 5 or so minutes. Now add your wine. Crank up the heat to medium-high and let it cook out. Reduce heat to medium-low and add your half of jar of sauce and simmer. If it’s to thick for you you can always add a little bit of water. Add salt and pepper to taste. 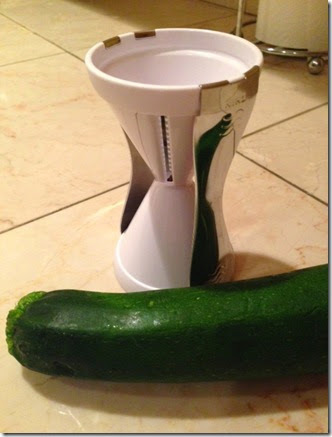 To prepare the noodles, take your zucchini and spiralize/shred/grate the entire thing. No need to warm up or heat. · By using zucchini, squash, carrots, cucumbers and potatoes, the Veggetti® creates thick or thin pasta with significantly less calories and carbs than traditional noodles. · Ordinary pasta has 800 calories and 160 grams of carbs compared to 60 calories and 8 grams of carbs using Veggetti®! Do you want your very own veggetti? Head on over to my facbook page and enter to win! 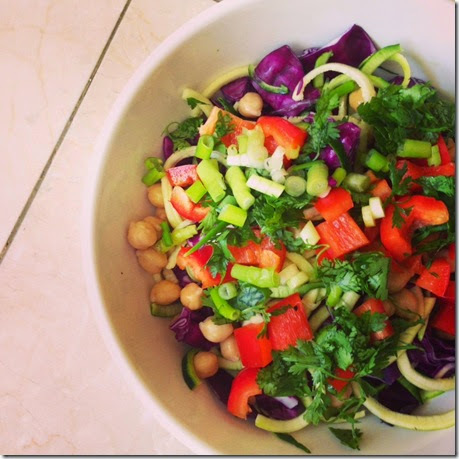 This entry was posted in dinner, product review, vegan, vegetarian. Bookmark the permalink. 1 Response to Veggetti Review and a Recipe!